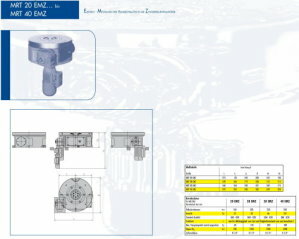 The rotary indexing tables of the MST EMS design were specially designed for work runs requiring rapid switching procedures and the greatest precision available. They are further development of the large ServoPress product palette. The advantages of the precision and enormously powerful RST together with the rapid MRT were amalgamated into one design. In these designs there is a complete lack of any hydraulic unit, valves, leads, setting and load adjustment problems. The only prerequisites for running this appliance are a simple directional control of the threephase motor and the connection of a compressed air hose with 6 bar. The minimum control required for the appliance enable you to have the fastest switching times <0.60 seconds and guarantee you a large number of switching actuations. This MST EMS design from ServoPress distinguishes itself by its long serviceable life and minimum maintenance work requirement. 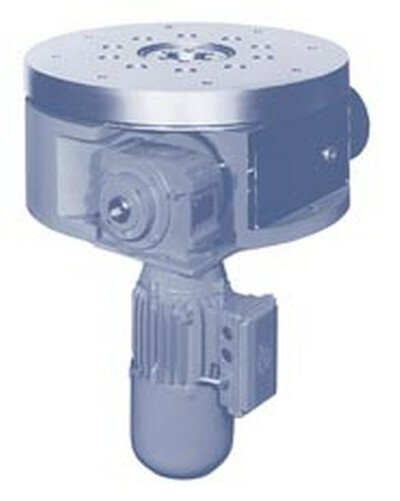 Via the drive shaft, the drive unit drives a face cam, a plate cam and the rotary disc valve. The face cam lifts the table out of its locking. After that the plate cam guides the table into rotation via the guide rollers. Finally the face cam lets the table gently sink into the coupling. The motor keeps running right through. Pulsating is done with a clutch brake unit fitted between the motor and gearing. A rapid switch electronic guarantees even coupling and braking. A frequency converter enables you to regulate the revolutions per minute. Setting-up operation with reduced speed is possible. With the emergency stop you can drive from the stop position into the basic setting. The emergency stop operation should only be applied if necessary. Reduced speeds with setting-up and emergency stop operation, revolutions per minute adjusted to suit conveyed load. Starting and delaying ram are possible. There is no coupling brake unit and therefore no wear and tear from brake linings. The refitting of brake plates in badly accessible places as is the case of the usual drives, is not necessary here.